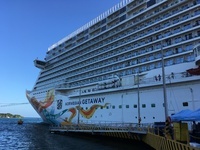 This was a 5-day Western Caribbean cruise out of Miami. We flew into Ft Lauderdale the day of and immediately took a shuttle to the port (we planned to spend a day in Miami when we returned). The experience immediately started off on the wrong foot when the man taking our bags demanded tips from us. He didn&apos;t tell us tips were welcome - he took our bags from us and said "Ok, now you have to tip me, pull out your wallets" Our group would have tipped him otherwise, but this now made us unwilling to do so. However, since our bags were at his mercy we felt as though he had no choice. We had two separate staterooms and he demanded money from both groups. He also threw the trash from the luggage tags straight onto the group and littered into the wind. Not a good first impression. Our greatest disappointment came from the terrible quality of the dining experiences. We ate dinner in one of the main dining rooms for 6 of the nights on our cruise. We ate early and never had to wait for a table but the service was consistently slow. I think there is only a single night where our meal took less than two hours. Even one day when we warned that we had a show reservation and that we needed to be out in an hour and a half, we had to leave before all of our food even made it to the table. We reminded the waiter twice that we had a time constraint and he assured us we would make it, and ultimately we left early and just got a snack at the buffet later. The menu options were completely uninspiring - nowhere near as exciting as the menus that were posted online. Every member of our group had meals that were so bad they had to be sent back - and we are adventurous eaters and foodies. It takes a lot for us to not like something. Some of these dishes include: pacific hake that was overcooked and tasteless, a steak that was ordered medium but came well done with the flavor and texture of leather, "taco cups" that were the saddest excuse for Mexican food I&apos;ve ever seen. This dish was literally just three Dorito chips with toppings sloppily thrown on. The meat platter served meats where most of them were available upstairs at the buffet, and the sausages were just as disgusting up there. We also ate at Shanghai&apos;s one night, where the service was outstanding but the food was average at best. The buffet was hit or miss for us. Sometimes we got great items (funny that the buffet had higher food quality than the main dining rooms). The Asian food options seemed to be standout selections there. We also had disappointing items, but would just go get new plates. After the terrible quality of food elsewhere, we were unwilling to pay more money for a premium dinner that would likely also disappoint. The entertainment quality was great, but the quantity was not. On other cruises, you may only have one option each night, but you can at least see something different each night. The Getaway advertised great shows but then there are only two options since they run multiple nights (without getting nickel/dimed into paying extra for a third show, that is). The comedy was good but the opening act did the exact same show for every set. Each comic had two sets and a theater set, which added up to three shows. But that still left two nights where there was no formal entertainment. Our cabin was an interior cabin, that was as expected and kept perfectly tidy by our cabin steward Patrick. He did an excellent job and could always remember which room was ours whenever we saw him. The ride was a little rocky at times with one of our group getting seasick one day, but I certainly would not blame that on the cruise company as they can&apos;t control the ocean. The deck experiences were alright. The pool was smaller than expected but the high number of hot tubs made up for that. The daily live entertainment and shows were decent although I did think the karaoke selections were very limited. For shore excursions, we did our own snorkeling excursion in Rhoatan. At Harvest Caye, we had just planned to do a beach day, which was good because there was hardly anything to do there. I&apos;m surprised it is even an excursion option. I would prefer to see this island skipped entirely and have somewhere more interesting added. It was also disappointing that it was Norwegian&apos;s island but we had to go back to the ship to eat for free. Other cruise lines I&apos;ve been on have served food on their islands. At Costa Maya, we did the Kohunlich and Dzibanche Mayan tours and had a fantastic time. Our tour guide Elizabeth was outstanding and provided a rich experience. It was a long drive, but her stories made it fly by. It was great to see these sites as they are very remote and I doubt I would have ever visited them otherwise. In Cozumel our group went to the Xplor park. Our guide Emilio again did a fantastic job and really went above and beyond. The park was very fun but we definitely felt rushed. We could have used an extra hour or two there. We also had the best food of the trip here with their outstanding Mexican cuisine. We tried stocking up there so we wouldn&apos;t have to suffer through another Norwegian dinner. Overall, given that this cruise was a bit more expensive that similar cruises during the same week and was on a newer ship, I was very much disappointed in the value. I think we would have enjoyed ourselves more if we had traveled with Royal Caribbean or Carnival for the week. I also didn&apos;t appreciated the constant nickel-diming from the company to pay for additional entertainment/food/services. I would not recommend Norwegian cruise lines in the future. This was a 5-day Western Caribbean cruise out of Miami. We flew into Ft Lauderdale the day of and immediately took a shuttle to the port (we planned to spend a day in Miami when we returned). The experience immediately started off on the wrong foot when the man taking our bags demanded tips from us. He didn&apos;t tell us tips were welcome - he took our bags from us and said "Ok, now you have to tip me, pull out your wallets" Our group would have tipped him otherwise, but this now made us unwilling to do so. However, since our bags were at his mercy we felt as though he had no choice. We had two separate staterooms and he demanded money from both groups. He also threw the trash from the luggage tags straight onto the group and littered into the wind. Not a good first impression. Our greatest disappointment came from the terrible quality of the dining experiences. We ate dinner in one of the main dining rooms for 6 of the nights on our cruise. We ate early and never had to wait for a table but the service was consistently slow. I think there is only a single night where our meal took less than two hours. Even one day when we warned that we had a show reservation and that we needed to be out in an hour and a half, we had to leave before all of our food even made it to the table. We reminded the waiter twice that we had a time constraint and he assured us we would make it, and ultimately we left early and just got a snack at the buffet later. The menu options were completely uninspiring - nowhere near as exciting as the menus that were posted online. Every member of our group had meals that were so bad they had to be sent back - and we are adventurous eaters and foodies. It takes a lot for us to not like something. Some of these dishes include: pacific hake that was overcooked and tasteless, a steak that was ordered medium but came well done with the flavor and texture of leather, "taco cups" that were the saddest excuse for Mexican food I&apos;ve ever seen. This dish was literally just three Dorito chips with toppings sloppily thrown on. The meat platter served meats where most of them were available upstairs at the buffet, and the sausages were just as disgusting up there. We also ate at Shanghai&apos;s one night, where the service was outstanding but the food was average at best. The buffet was hit or miss for us. Sometimes we got great items (funny that the buffet had higher food quality than the main dining rooms). The Asian food options seemed to be standout selections there. We also had disappointing items, but would just go get new plates. After the terrible quality of food elsewhere, we were unwilling to pay more money for a premium dinner that would likely also disappoint. The entertainment quality was great, but the quantity was not. On other cruises, you may only have one option each night, but you can at least see something different each night. The Getaway advertised great shows but then there are only two options since they run multiple nights (without getting nickel/dimed into paying extra for a third show, that is). The comedy was good but the opening act did the exact same show for every set. Each comic had two sets and a theater set, which added up to three shows. But that still left two nights where there was no formal entertainment. Our cabin was an interior cabin, that was as expected and kept perfectly tidy by our cabin steward Patrick. He did an excellent job and could always remember which room was ours whenever we saw him. The ride was a little rocky at times with one of our group getting seasick one day, but I certainly would not blame that on the cruise company as they can&apos;t control the ocean. The deck experiences were alright. The pool was smaller than expected but the high number of hot tubs made up for that. The daily live entertainment and shows were decent although I did think the karaoke selections were very limited. For shore excursions, we did our own snorkeling excursion in Rhoatan. At Harvest Caye, we had just planned to do a beach day, which was good because there was hardly anything to do there. I&apos;m surprised it is even an excursion option. I would prefer to see this island skipped entirely and have somewhere more interesting added. It was also disappointing that it was Norwegian&apos;s island but we had to go back to the ship to eat for free. Other cruise lines I&apos;ve been on have served food on their islands. At Costa Maya, we did the Kohunlich and Dzibanche Mayan tours and had a fantastic time. Our tour guide Elizabeth was outstanding and provided a rich experience. It was a long drive, but her stories made it fly by. It was great to see these sites as they are very remote and I doubt I would have ever visited them otherwise. In Cozumel our group went to the Xplor park. Our guide Emilio again did a fantastic job and really went above and beyond. The park was very fun but we definitely felt rushed. We could have used an extra hour or two there. We also had the best food of the trip here with their outstanding Mexican cuisine. We tried stocking up there so we wouldn&apos;t have to suffer through another Norwegian dinner. Overall, given that this cruise was a bit more expensive that similar cruises during the same week and was on a newer ship, I was very much disappointed in the value. I think we would have enjoyed ourselves more if we had traveled with Royal Caribbean or Carnival for the week. I also didn&apos;t appreciated the constant nickel-diming from the company to pay for additional entertainment/food/services. I would not recommend Norwegian cruise lines in the future. This tour was fantastic. Our guide Elizabeth did a fantastic job. She was knowledgeable and made the two hour drives go by very smoothly. The food wasn&apos;t great but what do you expect from brown bag lunches. The ruins were amazing and I loved that we were able to climb them. I also enjoyed that the locations were so remote, because I would not have ever traveled here otherwise. Our guide Emilio was fantastic. He really went above and beyond to make you feel like he was there only for your group when in reality, he had twenty other guests to manage. The park was really fun but I wish we had more time. We felt rushed and did not get to do quite everything we wanted. The food at the park was outstanding. Without a doubt the best we had on the trip and way better than what was served on the ship. We planned to do a beach day and we were lucky we did because there was very little to do on this island. Also despite being Norwegian&apos;s private island, the food is not complimentary. We traveled around South Beach afterwards and had a relaxing last day and had some outstanding Cuban food. The water was beautiful, the guides were polite and efficient, and we had a great time. The bar next door was great for some local Monkey La-la cocktails.